If you are wondering, 피에 젖은 초대장 is account-wide, too, and unlocks all your characters for brawlers guild. There is no need to buy this item if you already have the other one. Got my 싸움꾼의 통행증 from 둘그 스파인크러셔 on my first try. 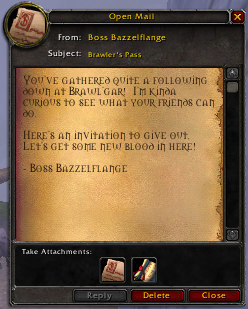 As of 7.1.5, the Brawler's guild has returned for Legion. This item is now a reward from the achievement 싸움꾼 조합의 두 번째 규칙 (3 시즌), for hitting rank 4. Got an 피에 젖은 초대장 invite from farming 헬라리아르 광전사 and 헬라리아르 영혼지킴이 elites in 방패의 안식처 Stormheim, running down to the hall. 이 아이템을 얼라이언스 (으)로 옮기면 싸움꾼의 통행증 (으)로 변경될 것입니다.